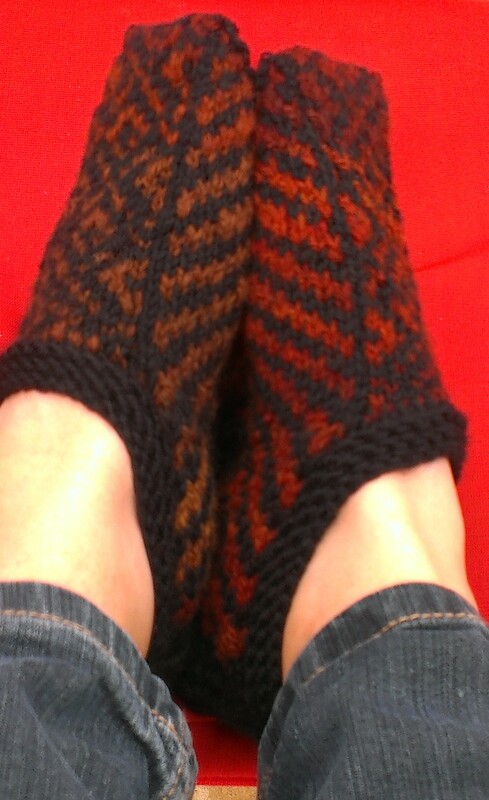 There have been two more pairs of Tingvoll slippers. Too much fun! Unfortunately, without going into boring detail, I have also been having a great deal of trouble with photographs. My phone suffered a major episode while I was in Melbourne and is now on its second trip to repair. The first visit fixed one problem but rendered the camera absolutely unable to focus. This has meant discovering not a single photo is in focus when it it too late to take another set… having unfamiliar equipment, no equipment, or using the retired cameras and remembering why they were pensioned off! So, my apologies for photo quality, and my hopes that my capacity to take pictures for the blog at will, and upload them with similar abandon, and access WordPress on my phone, will return soon. If you have been following along for a long while you might remember my dyeing project using eucalypts over grey Corriedale. I created two sets of yarn–one where I maintained the colour changes and one where I plied different coloured singles together. 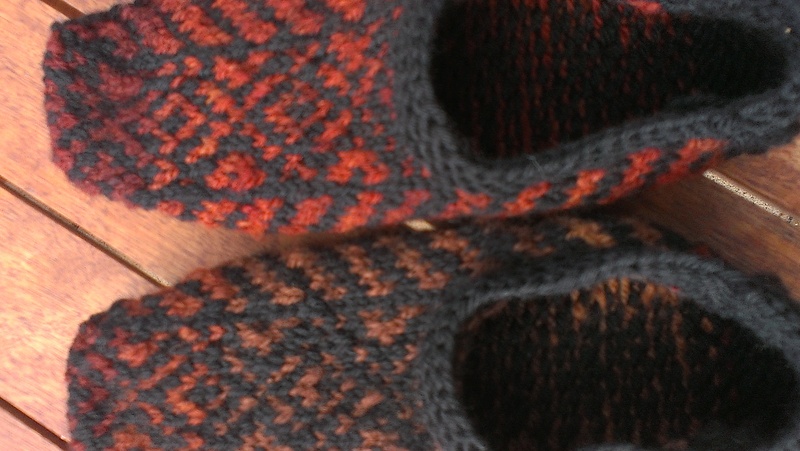 These slippers use the three ply colour-changes-maintained yarn. 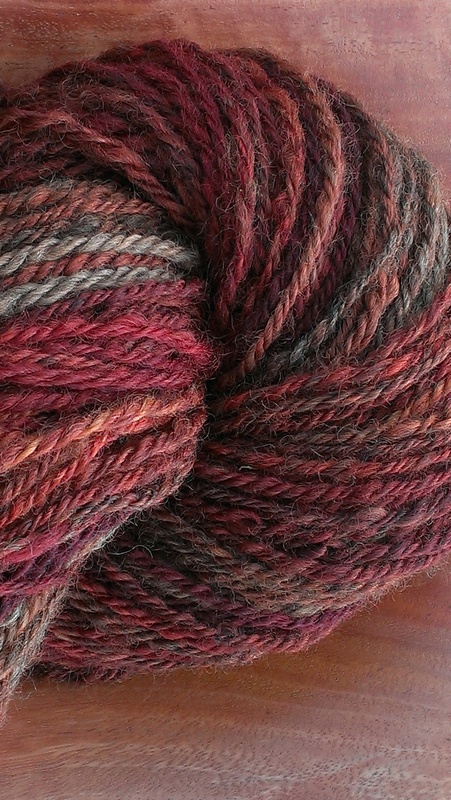 Until now, I had struggled to figure out what to make with something so lovely but so chunky. 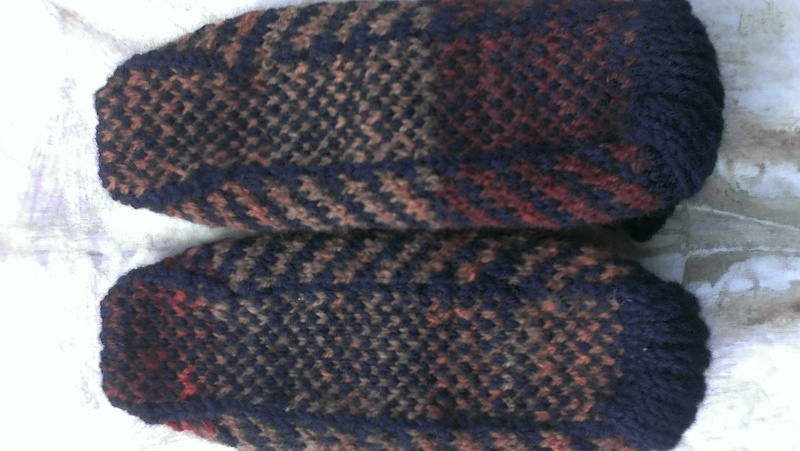 This first pair were made with 5.5 mm needles, my handspun eucalyptus dyed Corriedale wool and Bendigo Woolen Mills 12 ply, leftover from making slippers for a goth friend. They have gone to a different friend who is a writer. She said she might save them to be special writing slippers. What an exceedingly fine compliment. 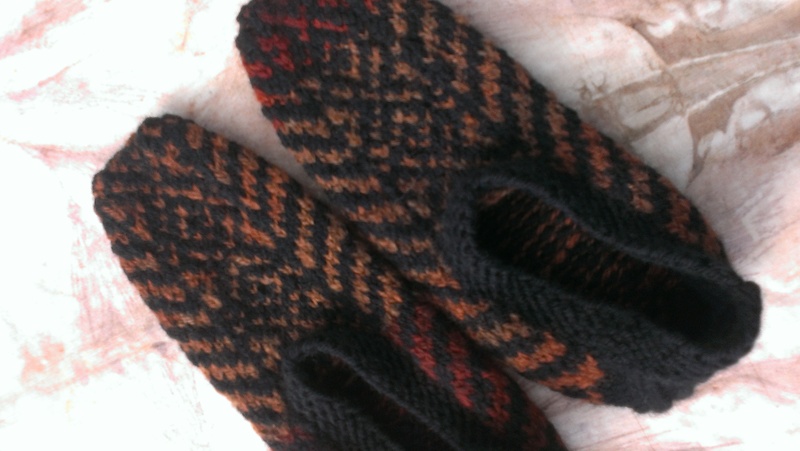 This second pair, knit on 5 mm needles, have gone to another dear one who spends her work life assisting people to recover from trauma. I hope they will gladden her heart! Having done it three times I began to find the chart so much easier to follow… my sense of following a chart as difficult began to ebb away. 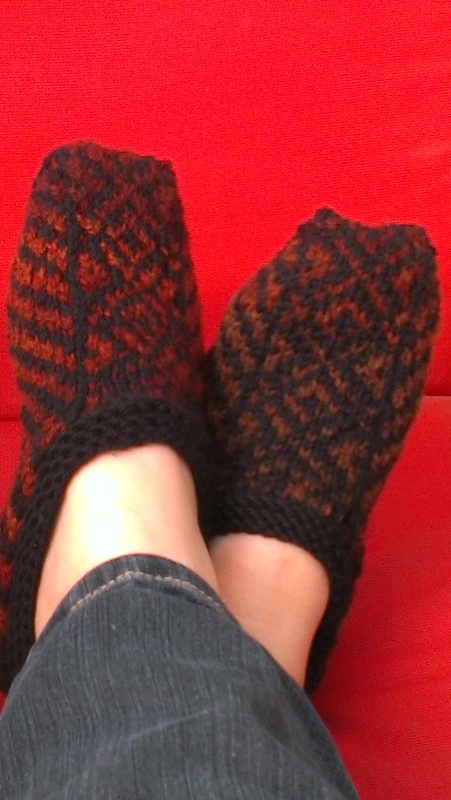 My confidence that I can do colour knitting began to grow stronger. I began to have that sense of happy familiarity you get with a song you have listened to a lot. I now have my first set of metal DPNs and I like them very much–I tend to use circulars for most knitting in the round–and I mostly do knit in the round. But in this case the pattern divides into four sections in a way that I decided very much lent itself to DPNs. Lovely! I can only recommend this pattern.